Jacksonville, NC - Loose Rocker Promotions brings Big Bucks Bracket Racing for Top E.T. 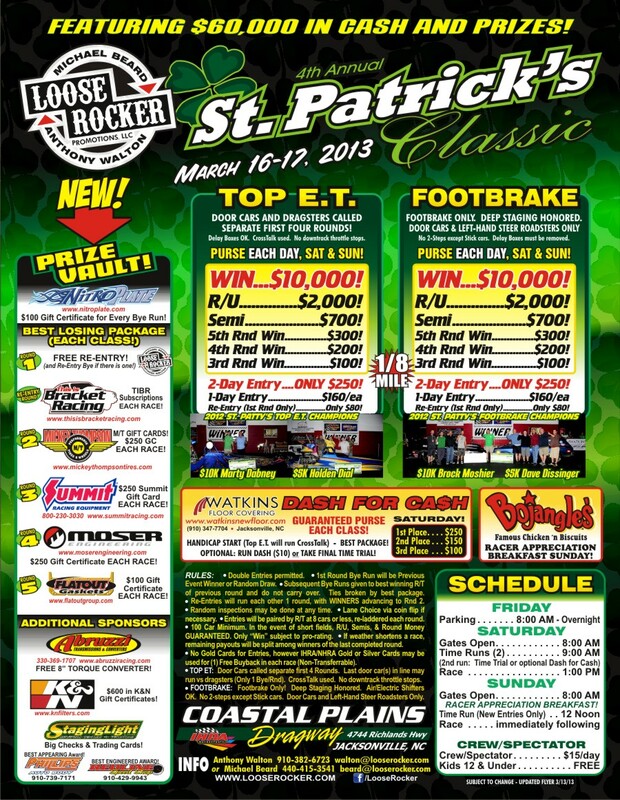 and Footbrake Racers to Coastal Plains Dragway this Saturday and Sunday with their 4th Annual St. Patrick's Day Classic. Parking all day Friday thru the night with racing action kicking off at 9 a.m. Saturday morning. 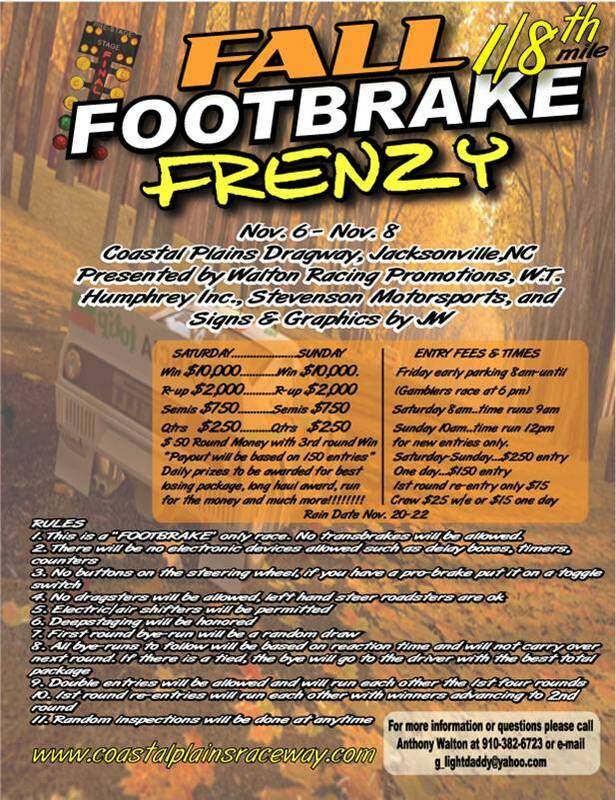 Jacksonville, NC - The $20,000 Footbrake Thanksgiving Tradition continued with the Fall Footbrake Frenzy IV at Coastal Plains Dragway where the country's highest-paying Footbrake race awarded the $20,000 check to William Roberts, while Richard Alford bookended the weekend's $5K's. Jacksonville, NC - There were plenty of familiar faces among the 171 racers who made possible the return of the $20,000 main event to Thanksgiving weekend. 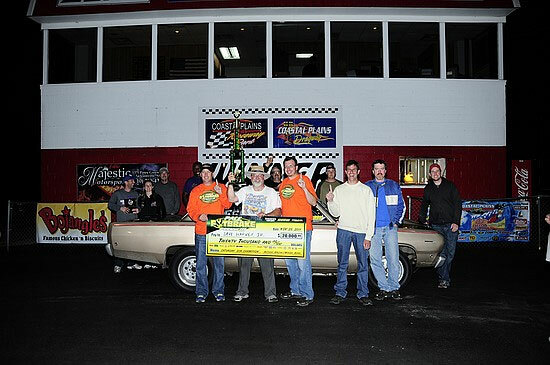 New Jersey drivers reclaimed dominance when the dollars were on the line, none more spectacularly than Dave Harvey, Jr.
Jacksonville, NC - The Fall Footbrake Frenzy brings $20,000 Footbrake racing back to Coastal Plains Dragway this Thanksgiving Weekend. Gates open Thursday evening for parking. Friday gets underway with time trials at noon, giving racers plenty of travel time. 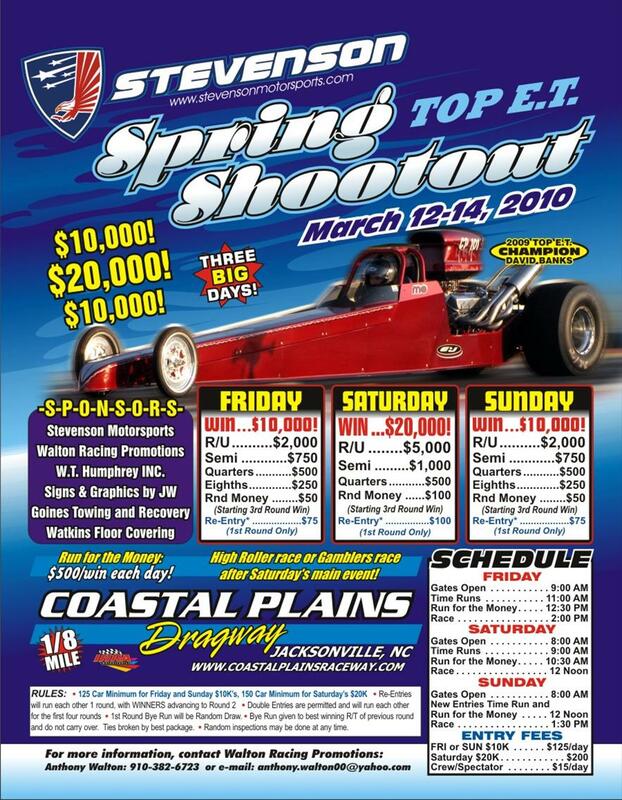 Jacksonville, NC - Coastal Plains Dragway will host the Top E.T. Spring Shootout this weekend. 3 big days of bracket racing with $10k to win on Friday and Sunday and $20k to win on Saturday. A "High Rollers" race will also be held Saturday evening. 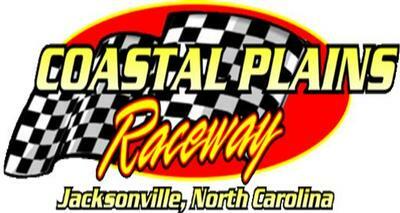 Jacksonville, NC - Race Traveler information attached. 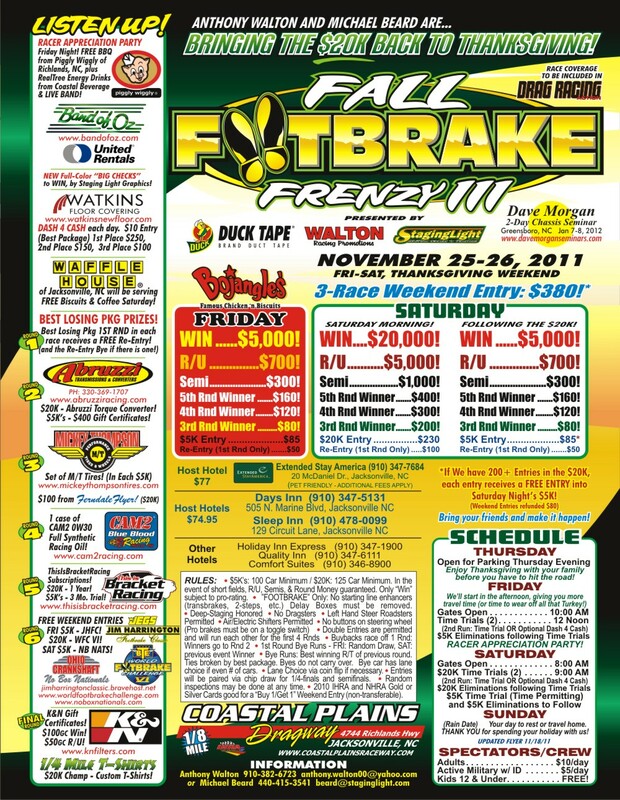 Anthony Walton and the crew at Coastal Plains Dragway are gearing up for $10k to win footbrake action - Flyer Attached.